02/06/2018. 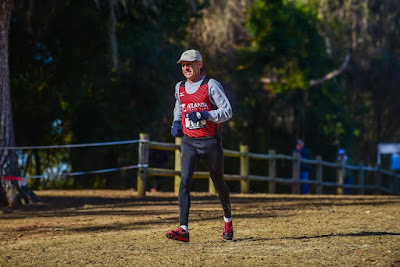 It was a fine morning for a cross country meet at Apalachee Regional Park in Tallahassee. The skies were mostly sunny, the winds light, and the temperatures mild. 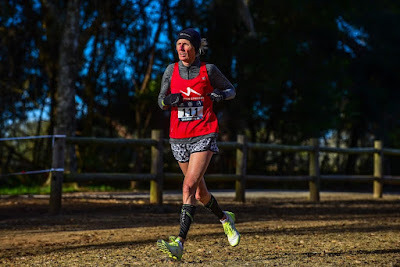 There were 40 degree temperatures at 9AM when the Masters Women toed the line for their 6K contest, and mid-40’s 45 minutes later when the Masters Men went off on their 8K race.Auspicious conditions were observed for the 2018 USATF Masters Cross Country Championships, the first event of the new year and 2nd for the 2017-18 Masters Grand Prix. 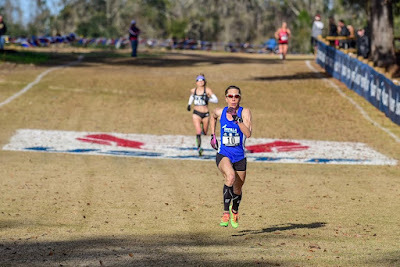 In 2016 when they held the National Club Cross Country Championships on this same course at Tallahassee, Sonja Friend-Uhl sprinted away over the last 500 meters to take the crown. But there was a different set of competitors this time. Jennifer Bayliss and Maggie Shearer formed a lead pack with Friend-Uhl in the first loop of the 6K course. Marisa Sutera Strange, who would ordinarily be tracking the lead pack was not as close to the front this time because of some lingering fitness issues. 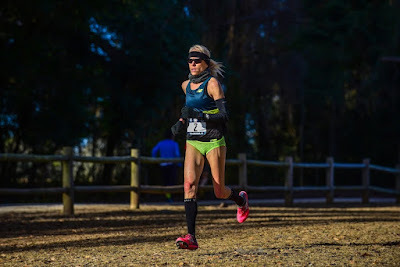 The lead pack hit the 2K mark in the forested section of the first loop in 7:42; Kimberly Mueller was all alone 18 seconds back from that pack but nearly ten seconds ahead of Strange and Carla McAllister. The lead pack was still intact when they sped past the main spectator area 3K into the race. Mueller was now 40 seconds back from the leaders, but now Strange had closed to within two seconds, leaving McAlister 5 seconds behind. 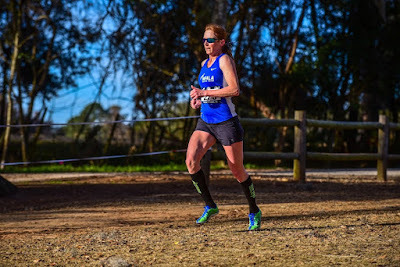 By the 5K mark in the forested section of the 2nd loop there were the first signs that the pace might be too much for Friend-Uhl, as she was now 3 seconds back from Bayliss and Shearer, not a large gap but a gap nonetheless. Strange was still 43 seconds back but now had an 8 second gap on Mueller who had a 9 second gap on McAlister. From there Bayliss and Shearer were able to gradually pull away from Friend-Uhl. 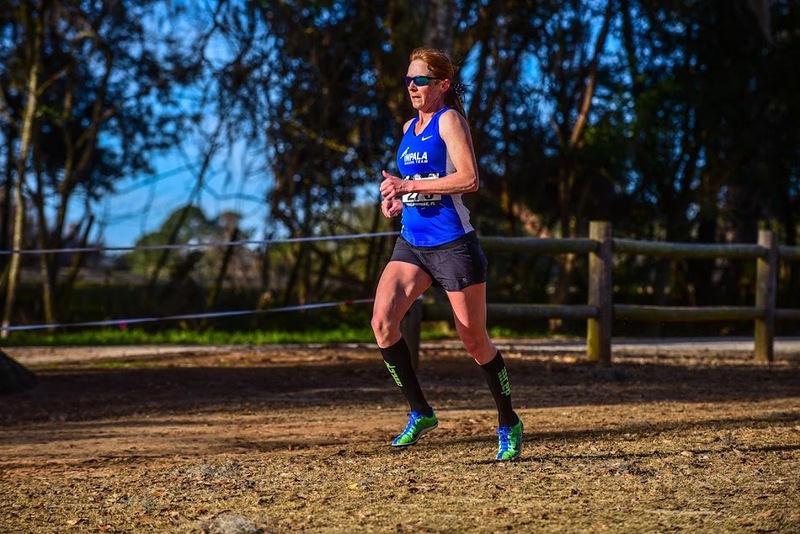 Bayliss used her strength on the final uphill section, dubbed ‘The Wall’ to gain an edge over Shearer which she maintained over the final 500 meters after cresting the hill, racing along the flat and then downhill to the finish. Shearer put on a terrific burst of speed but Bayliss was equal to it and kept the substantial 5 second gap she had created on the Wall. Bayliss won in 22:14 with Shearer claiming the second spot in 22:19. 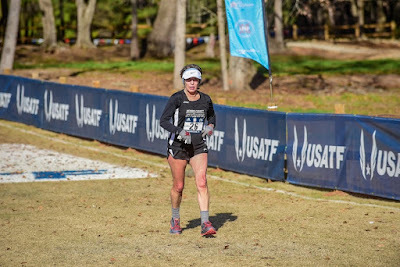 Jennifer Bayliss wins the Overall Masters Race at the 2018 USATF XC Championship with Maggie Shearer and Sonja Friend-Uhl in the background finishing 2nd and 3rd. Friend-Uhl, focused on Track goals, finished 3rd in 22:33 with a 55 second margin on Strange who held on for 4th despite being off her best. Bayliss earned her first Masters Grand Prix Championship and Shearer claimed her first podium at an MGP Championship Event. 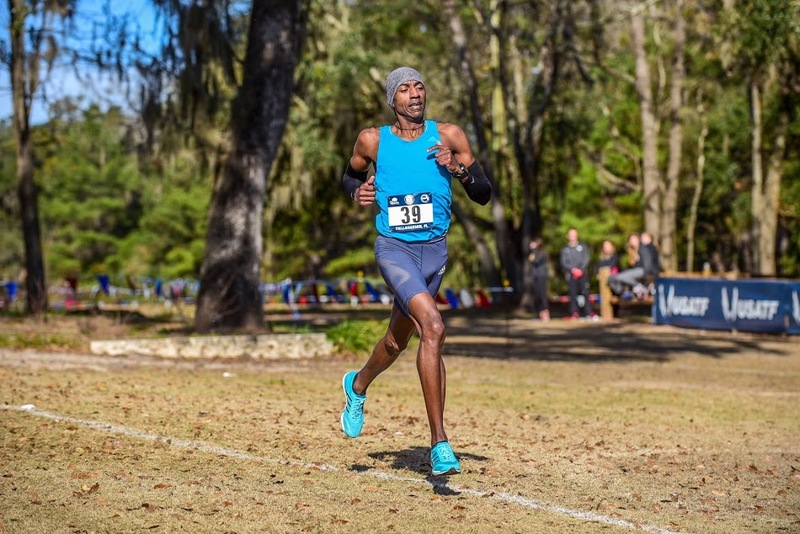 Just as in the December 2016 Club Cross Country Championship, Kevin Castille shot away from the starting line when the gun sounded and was in a race of his own the rest of the way. 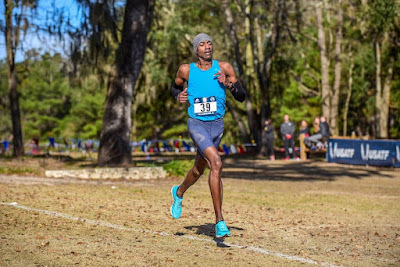 Castille had almost 45 seconds on the field by the time he crossed the mat just beyond the 2K mark; he pushed the lead further and further ahead the rest of the way and won the 8K race by over 3 minutes in 24:18.6. 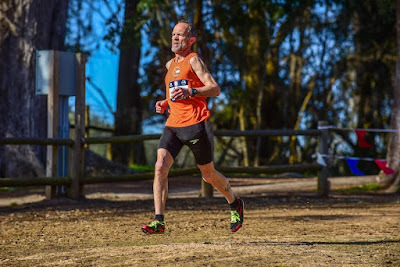 David Angell, running fairly soon after a freak accident where he injured his knee, with the knee wrapped in KT tape, found himself in 2nd place in ‘no man’s land’ for much of the first 2 kilometers of the race, with Castille out of sight 43 seconds ahead, and a ten second gap back to a 9-runner chase pack that included: Christian Cushing-Murray, Elliott Frieder, Jonathan Frieder, Mark Hixson, Nat Larson, Kent Lemme, Mike McManus, Eric Stabb, and Sam Teigen. In the next kilometer, Angell grew the gap to 16 seconds as they passed the Jumbo-tron screen at the end of the first loop. The Greater Springfield Harriers teammates, Hixson, Larson, and Lemme, along with Cushing-Murray, were leading the chase group that started to gradually cut into Angell’s lead, dropping it to 12 seconds by the 5 km mark and holding the margin there through 6 kilometers. By the 6 km mark, the chase pack was no longer holding together fully as a small gap developed between the first 4 and the rest. And then the surge came, as the 3 Harriers led the way in closing the gap to only 3 seconds by the 7 km mark. Now Angell could hear them closing in, sensing that someone would soon rush by. And they did, as Larson and Lemme passed with authority and pulled away. But Angell was determined to fall no further and was holding Cushing-Murray. Hixson, and E. Frieder, who had crossed the gap to the leading chase pack, at bay, while the rest of the pack was not able to close with them. Larson and Lemme poured it on, leaving nothing to chance; they battled to the finish line and Lemme had the better kick, claiming 2nd in 27:36, with Larson two seconds back in 3rd. Angell kept ahead of everyone else, gutting it out to a 4th place finish in 27:50, with Cushing-Murray 21 second back and then Hixson another second and E. Frieder in 7th at 27:54. The remainder of the chase pack, Teigen, Stabb, J. Frieder, and McManus, claimed 8th through 11th in that order. Castille demonstrated again that no other Masters runners can stay with him. Lemme, Larson, Cushing-Murray, and Hixon showed you can be a top Masters Elite Runner after 50, and Angell showed he could overcome freak accidents and still run pretty darn fast! Age-Grading prizes went 5 deep on the Men’s and Women’s sides; age-grading is a measure of how well a runner has raced relative to their age, with 100% being the highest and best score. 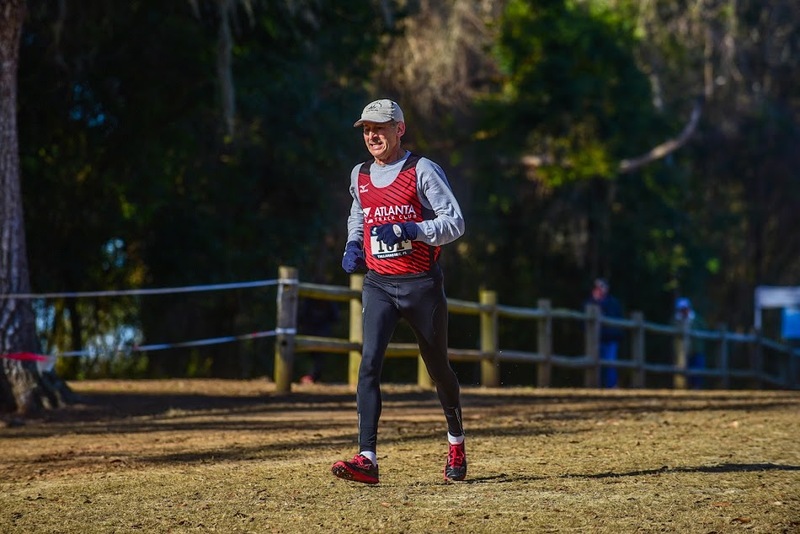 Age-Grading scores are ordinarily lower on Cross Country courses compared to roads but the Tallahassee course is much closer to a road course than is typical and probably grades a little tougher than a hilly road course. Kevin Castille, 45, the overall winner, also, as usual, took the top age-grading prize at 94.56%. 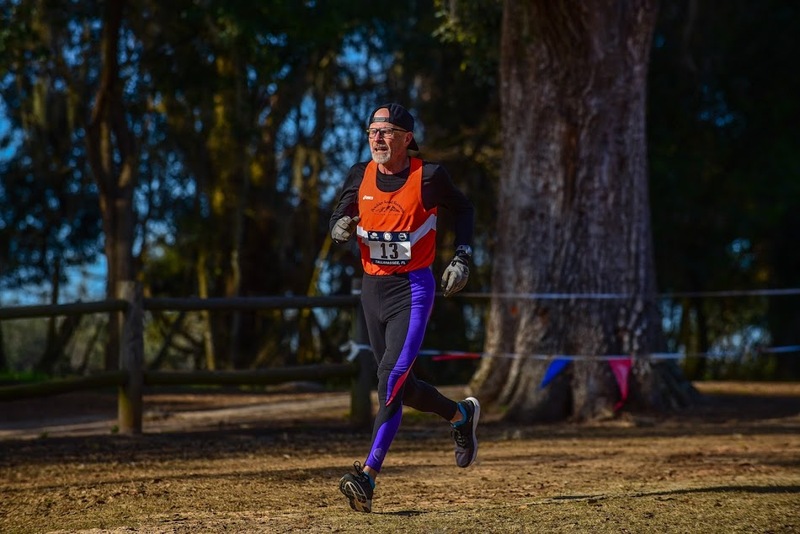 Rick Becker, 63, struck a blow for the age 60 and up runners when his 29:30 earned the 2nd highest age grade score at 90.76%. A dynamo on the Cross Country course, Becker will add this to his silver and gold age-grading medals from Boulder and Bend in 2015 and 2016. Larson, 55, Lemme, 51, and Hixson, 52, closed out the Men’s age-grade prize list with 90.23, 87.42, and 87.30. Larson will add this to his growing collection of Age-Grading podiums at National Championships; he had 7 in 2017, 3 of them gold. Sabra Harvey, USATF’s 2017 Masters Athlete of the Year, took the top spot among the Women at 94.37. Marisa Sutera Strange claimed the 2nd prize with a 89.37, followed by Doreen McCoubrie, Trish Butler, and overall winner, Jennifer Bayliss, at 88.42, 88.11, and 87.11. Strange had 6 such podium performances last year, 4 of them silver. The Women's Age Division Championships were contested over the 2-loop, 6 kilometer course at Apalachee Regional Park while the Men's Championships were contested over the 2-long and 1-short loop 8 kilometer course. The course is not as challenging as some cross country courses but as usual, there were a few tricky places to navigate. And, of course, there were some terrific races and races within races. 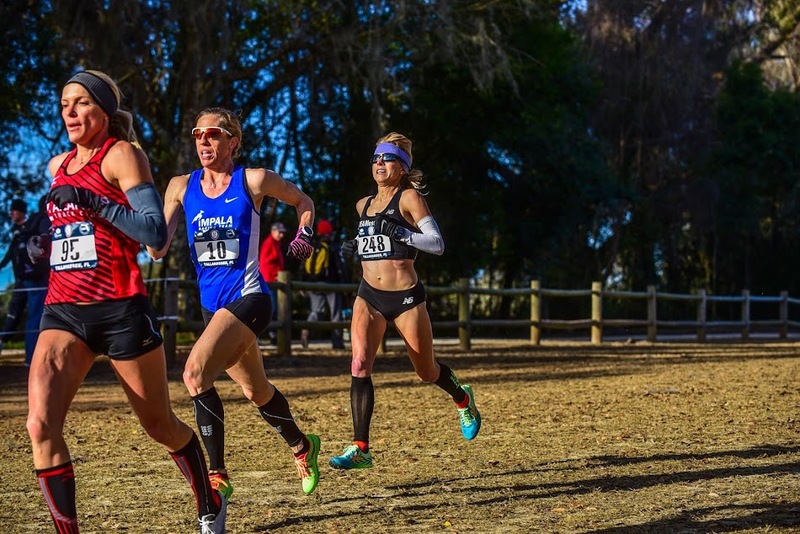 The entire podium for this division of the Women’s Championships made the cross country trip from Southern California—Maggie Shearer from greater L.A., and Kimberly Mueller and Carla McAlister from the greater San Diego area. As the Overall recap makes clear, Shearer was in the hunt for the Overall win until the last few hundred meters of the race. She won thje division by over a minute. Mueller established a 9 second gap over McAlister in the first 2 kilometers. Over the next kilometer McAlister cut very slightly into the lead, cutting it to 7 seconds. 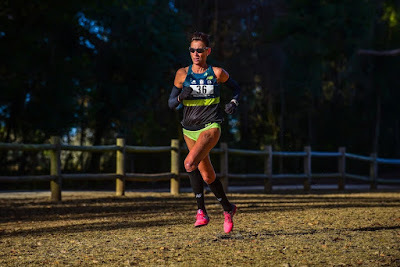 But by the time they were at the 5K mark on the back forested portion of the second loop, Mueller had lengthened the gap back to 9 seconds and stretched it slightly the rest of the way, coming in at 23:37 with a 14 second lead over McAlister. It was a clean sweep for So Cal and a first Age-Division podium appearance for all three. As noted in the Overall section, David Angell went out hard, in 2nd place overall, ten seconds ahead of Teigen and the rest of the chase pack by the 2K mark in the woods. Teigen in turn had 16 seconds on Chuck Schneekloth, who had another 15 seconds on his Garden State teammate, Aaron Cooper. None of that changed in any substantial way during the race. 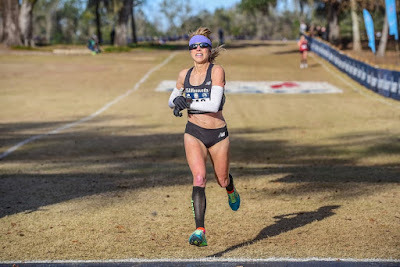 Angell widened the gap with Teigen to 16 seconds by the 3K mark but then Teigen got it back down to 14 by the 5K mark. Despite Teigen’s best efforts, Angell was able to keep the gap at 14 to 15 seconds all the way to the finish line where his 27:50 gave him a 13 second final margin over Teigen. The gaps between Teigen and Schneekloth and between the two teammates grew during the race. Schneekloth claimed the final podium spot at 29:08. Angell won four division gold medals last year. He has one in his pocket now; will 2018 be a better year? Thomas found another gear and pulled away to claim the bronze medal in 24:03 with Dean 15 seconds back. Kevin Castille won the Overall Race and this division in 24:19. With Castille in a class by himself, the twins, Elliott and Jonathan Frieder, focused on the race for fraternal honors, while keeping all others at bay. Their races have been dominated recently by Jonathan but I understand that Elliott had been dominant before an injury slowed him down. His times have been improving lately; would this be the race where he reinserts himself in the mix? As was clear form coverage of the overall Race, the answer was yes. The twins settled into the main chase pack and stayed there running stride for stride through the first 5km. They had a growing margin on their main challenger, Brent Fields, of Atlanta, 6 seconds at the 2K but 15 seconds by the 5km mark. By the 6k mark, Jonathan was lagging slightly but was still in touch with the chase pack, 3 seconds back from Elliott. Fields was now 20 seconds back. Elliott Frieder was able to close strongly, gaining another 3 seconds in the next to last kilometer and then brought it home in 27:54, 15 seconds ahead of brother, Jonathan who, in turn had a half minute on Fields. Although he was not able to make the podium, Fields had the satisfaction of running a much better XC race here in Tallahassee than he experienced in Lexington at Club XC, where he finished well over a minute back from the Frieder’s. Elliott had his first win over brother, Jonathan, in some time; they are even for the 2017-18 Masters Grand Prix season as Jonathan took the honors at Lexington. It will be fun to see how things go in Virginia Beach! And it is always an exciting event when Castille shows up at a National Championship. It seems there are no Masters Runners, with the possible exceptions of Abdi, Bernard, and Meb who can run with him at present. The 8K course at Virginia Beach is flat and fast! Will that attract Castille? The current US record of 24:14 was set there by Dennis Simonaitas in 2010.
and Bischoff nearly three minutes behind her. The top 4 runners in the Men’s 50-54 division were in the hunt for the Overall podium so this recap is a repeat of that one. Christian Cushing-Murray, Mark Hixson, Kent Lemme, Mike McManus, and Eric Stabb all went out in the main chase pack. All hung together through the first 5 kilometers but over the next kilometer, McManus and Stabb started to lose touch. 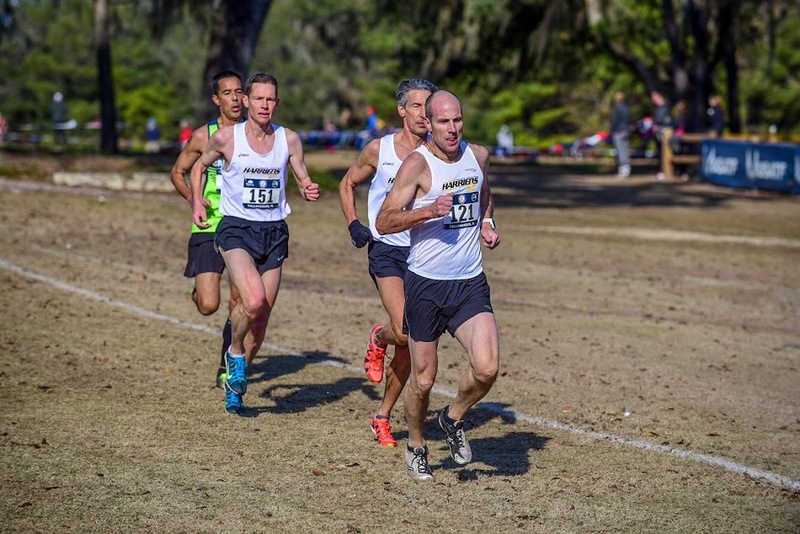 The division leaders passed the 6K mark in 20:55, with a gap of 6 seconds back to McManus, with Stabb a stride back. Despite their best efforts, McManus and Stabb could not close the gap. The other three held together until the final kilometer when Lemme took off. Lemme kickied away to take the division in 27:36. Fifteen seconds passed by before Cushing-Murray kicked away from Hixson to claim second, with Hixson one second back in 3rd. Stabb took 4th another 15 seconds back with McManus right on his heels. Lemme had a terrific 2017 and it is great to see such a good start for him in 2018. There was a tight race in this division. Doreen McCoubrie took it out hard, thing the 2.2K mark in 8:20 with Trish Butler biding her time, 6 seconds back. Lynn Cooke was 25 seconds back in 3rd but with a 15 second lead over Suzanne Cordes, her main rival for the final podium position. McCoubrie hit the mat just beyond the 3 K mark in 12:44 with Butler now 9 seconds back. Cooke was now over 45 seconds back but had widened her lead over Cordes to nearly half a minute. 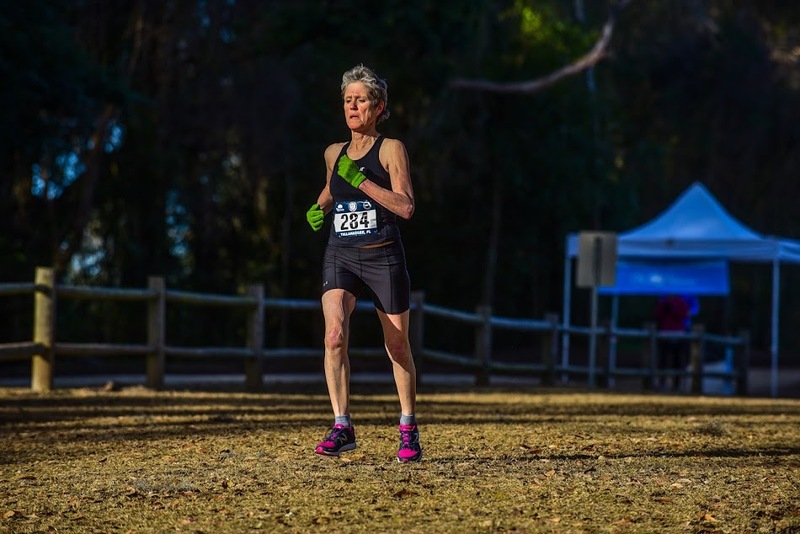 The next 2 kilometers proved crucial as Butler found another gear and closed the gap on McCoubrie, passing her just before the 5k mark and accelerating up’ the Wall’ onto the flat and down to the finish line in 24:04. McCoubrie was 12 seconds back in 2nd. Cooke claimed third with nearly a minute lead on Cordes who took 4th. This was Butler's first Grand Prix victory since returning from injury last year. There was no such drama about who the winner of the Men’s 55-59 division would be. The favorite, Nat Larson, was in competition for the overall race podium. He hit the 2.2 mark in 7:17 and even though Jeffery Dundas is running like his former self, he was almost half a minute back at that point. No worries though, he had built a 14 second lead over Kevin Paulk who had, in turn, a 7 second spread on Timothy Riccardi. Larson widened his lead on Dundas all the way to the finish line and Dundas did the same relative to Paulk. Larson took the win in 27:39 with Dundas two minutes and 40 seconds back in 2nd, and Paulk just over two minutes back in 3rd. Riccardi first threw a bit of a scare into Paulk however. Riccardi closed the 6 second gap between the 2.2 mark and the first trip past the Jumbo-tron as they sped, stride for stride, past the spectator area. When they passed the 5K mark in the forested section, Riccardi had 10 seconds on Paulk. 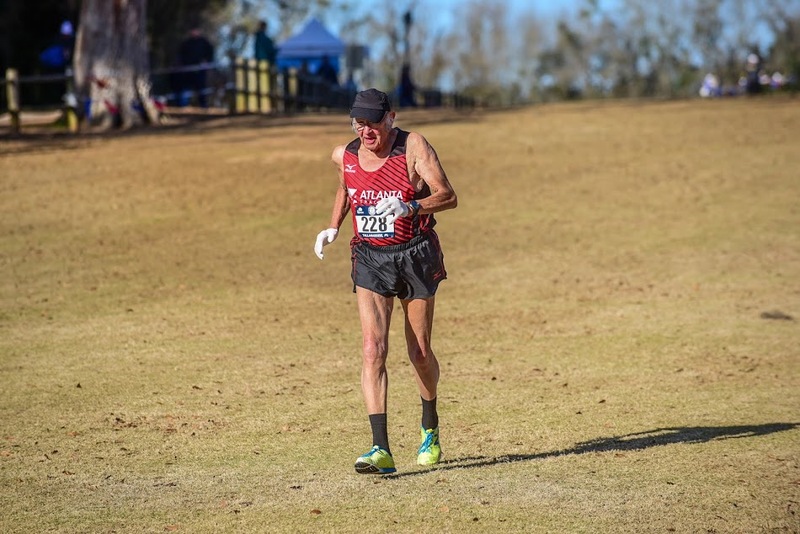 Riccardi kept that lead through the 2nd pass of the spectator area at 6K, and things were not looking good for Paulk, but then Paulk made his move, closing down on Riccardi by the 7K mark and then kicking past and up the wall and over the top to the finish. Paulk had his podium finish after all in 32:23. Riccardi took 4th by 16 seconds over a fast closing Bob Nugent. This was the division on the Women’s side that attracted the most entrants as Atlanta, Genesee and Syracuse contested for the team championship. The leader of the pack was an outsider though and unattached, Catharine Utzschneider. She took off at the gun and was never headed. Hitting the 2.2 mark in 9:38, she forged an 16 second lead on the field. 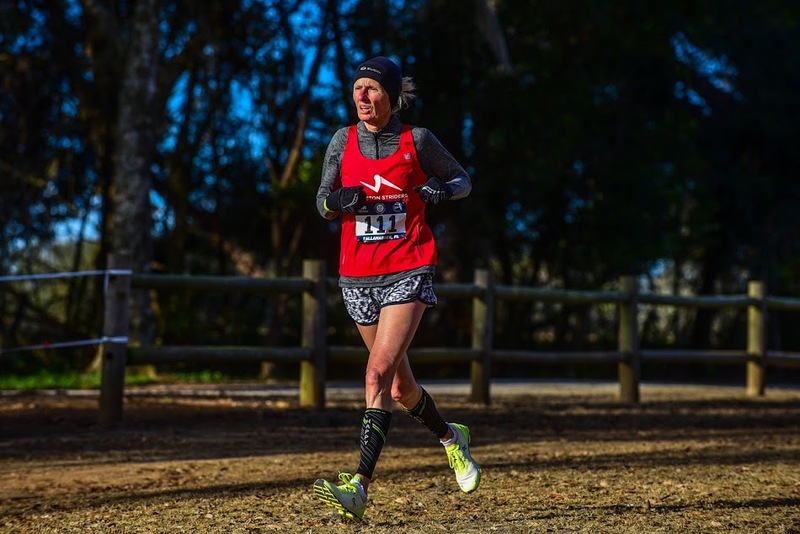 The three other runners with the best shot at the podium were Patricia Ford, Sharon Moore, and Cynthia Williams, who all locked horns at Club XC in Lexington KY two months earlier. At that time it was Ford, Moore, and Williams in that order at the end of the race. At the 2,2 K mark in this race, it looked like we might see a repeat as Ford crossed the mat in 9:53, with Moore two seconds back and Williams one further second back. But between there and the end of the first loop, Williams threw in enough of a surge to eke out a 4 second edge over Ford, with Moore 5 seconds behind Ford. The next 2 kilometers saw Williams stretch her lead to 17 seconds with Ford holding a 7 second edge over Moore. The last kilometer saw Williams finish off her strong run in style, claiming 2nd in 29:11. Moore had quite a kick, taking 5 seconds out of Williams’s lead and speeding past Ford who had no kick on this day. Moore finished 19 seconds back from Williams but 24 seconds ahead of Ford. Utzschneider in the meantime had added to her lead throughout the race, hitting the finish line in first with a time of 27:55. Rick Becker, in the same way, left nothing to chance. 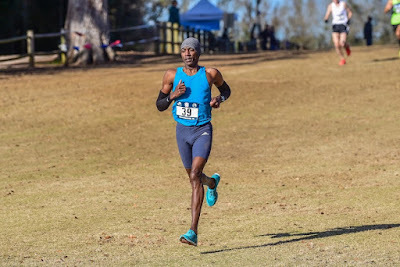 He had 10 seconds on his closest rival by the 2.2 mark and poured in on all the way, pushing the margin to over half a minute by the 5k mat and to over a minute by the 7K mark, finishing in first in 29:30. 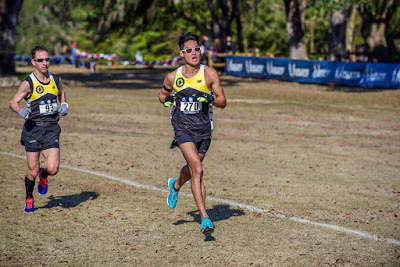 That gave him another USATF XC Division gold medal to go with the ones he won at Boulder and Bend in 2015 and 2016. Ken Youngers, who had the early lead at Lexington, only to be passed by Becker in the final 400 meters, ran strong, with even greater margins back to the rest of the field than Becker had on him. 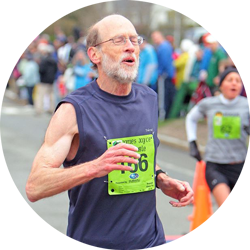 He had nearly 20 seconds on a chase group of 60-64 year olds by the 2.2 k mat, and grew that to nearly a minute by the 5K mark. He continued to grow the margin, finishing in 2nd at 30:51 with over a minute to spare. In the meantime Michael Anderson, Brian Nelson, Reno Stirrat, Kevin Dollard and Brian Cummins had a fun dust-up for the last podium spot and for team honor. Only 2 seconds separated Anderson, Nelson and Stirrat at the first mat, with Dollard 9 seconds back and Cummins another 9. Anderson was able to work away from Nelson and Stirrat enough to have a 6 second gap on them by the 5K mark. Nelson narrowed it to 3 seconds by the 6K mark but them Anderson found the grit tohold him off and then, after the 7K mark to surge up the Wall and over the top to claim 3rd in 31:55 with a final margin of 9 seconds. Nelson took 4th, followed by Stirrat 9 seconds later. Dollard held on for 6th but Cummins, with a late surge, almost caught him, finishing only 3 seconds back. Sabra Harvey, USATF’s 2017 Masters Athlete of the Year was expected to run a fast time and win the division. She did not disappoint. Her winning time of 26:32 won the age-grading contest and allowed her to take the division title with ease. Terry Foody took 2nd. 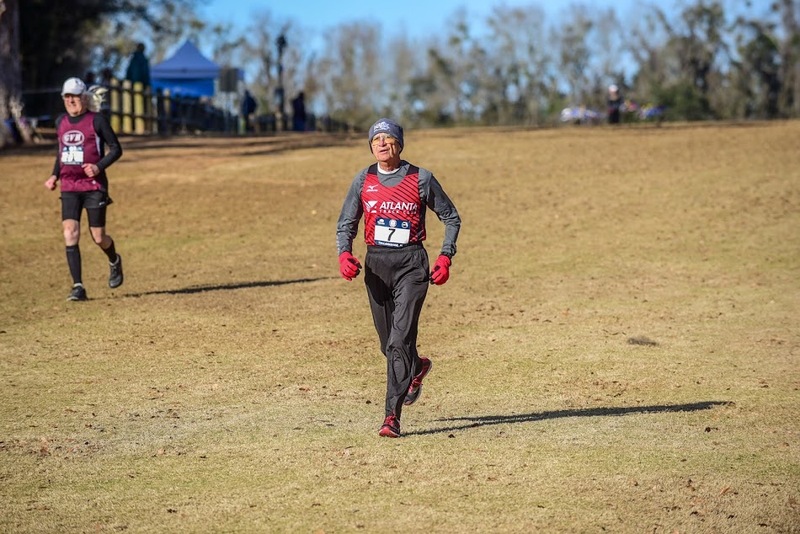 Fifteen runners contested the Men’s Championship with the primary fireworks involving Doug Bell, Kirk Larson, and Chuck Smead, with Richard Katz and Lloyd Hansen not far off the pace. Bell has perhaps put his back issues behind him. In any case he had a really good run, hitting the 2.2 mat in 8:12 with almost 20 seconds on his closest pursuer, Boulder teammate, Chuck Smead. He grew that margin steadily; it was over a half minute edge by the 5k Mark. Bell brought it home in 33:00, with a 45 second winning margin. Smead, in the meantime, had to beat back a challenge from Larson. Smead had a 7 second margin on Larson at the 2.2 k mark but by the time they passed the Jumbo-tron screen at the spectator area, Larson had cut the lead to 4 seconds. Smead built it back up over the 2nd large loop, re-establishing the 7 second margin by the time they passed the spectators again. At the 7K mark, Smead had 10 seconds on Larson. But then, heading up the Wall, the wheels started to come off and Larson could see he was gaining on Smead. Up over the top and on down to the finish, with Larson gaining with every step. Smead was tough, however, finishing off strong to claim 2nd place in 33:46, with Larson just 4 seconds back in 3rd. The battle between Katz and Hansen was pretty one-sided through the first 6K as Katz gradually grew a 30 second margin. Hansen would not give up though, and cut the margin to 24 seconds by the 7K mark but then ran out of race course as Katz still had 19 seconds on him at the finish. Katz took 4th and Hansen 5th. The Women’s 70-74 division was not contested. John Combs, a relative newcomer from the west Coast went off the fastest, hitting the 2.2k mark with a 12 second lead over Dave Glass, who was followed closely by Gene French and Tony Gingello, with David Peterson and Bill ‘Coach’ Sumner a few seconds back. Glass left the others behind over the next kilometer, taking 2 seconds out of Combs’s lead; Gingello and French came 9 seconds later, separated by 2 seconds. It was 13 seconds back to Peterson who now had 8 seconds on Sumner. Glass continued to cut into Combs’s lead over the 2nd loop0, reducing it to 4 seconds by the time they went past the spectators for the 2nd time. Now it was 20 seconds back to Gingello and French who were still locked in battle 2 seconds apart. Further back Peterson now had 10 seconds on Sumner. Between 6 and 7 kilometers, Glass passed Combs and pulled away for a 7 second margin with a kilometer to go. He poured in on from there, winning the division in 36:22. Combs finished 2nd 15 seconds back. French was never able to get by Gingello and Gingello is very tough once he is inside of 300 meters. Gingello took 3rd in 37:08 with French in 4th just 4 seconds back. Sumner, meanwhile, had pulled to within a second of Peterson with a kilometer to go and was able to hold on and then kick away to take 5th by 3 seconds—some tight races there! 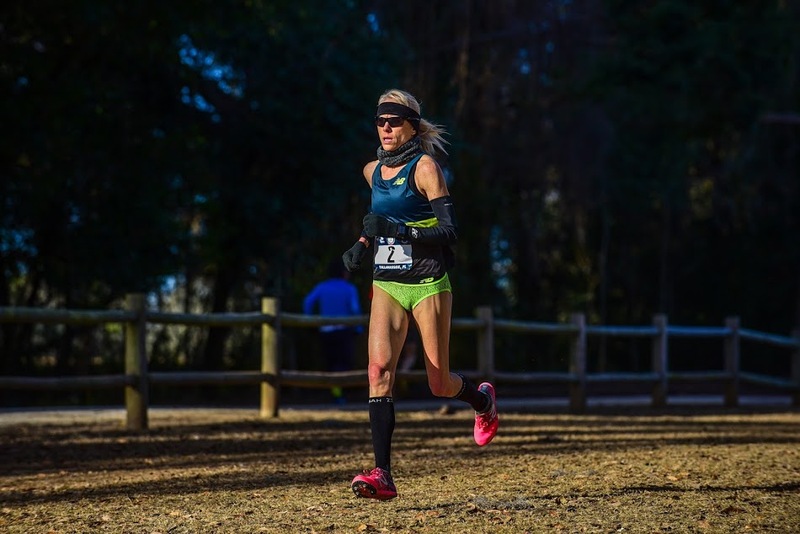 Madeline Bost, winner of the 2017 Masters Grand Prix Individual title in this division, took first place in the division in 49:15. Last October Robert Hendrick took 3rd in the hotly contested 70-74 division at the 15K Masters Championships in Tulsa. Clearly he has managed the transition to 75-79 well. He stepped through the first 2.2K in 9:33 with a lead of over a minute on the field. From there Hendrick grew the lead continuously, winning the division by well over 4 minutes in 38:04. Atlanta teammates, Charlie Patterson and David Turner were battling to see how the rest of the podium would go. In Lexington Turner took the honors by 8 seconds and Patterson was looking to reverse that outcome. Nonetheless, Turner took it out stronger, holding a 3 second lead at the 2.2k mark and grew that to 7 seconds by the first time they passed the spectator area. It looked like maybe Patterson would need to wait until next time to get his revenge. But the next 2 kilometers went Patterson's way as he caught and passed Turner, establishing his own gap of 9 seconds. From there it was all Patterson as he came home in 43:48 in 2nd place with almost a minute on Turner. Ed Bligh finished 4th in 45:20. Eve Pell took first place in the division in 38:19. 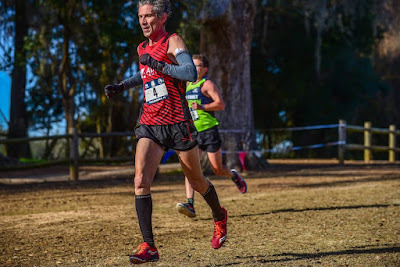 Jim Askew, winner of the 2017 Masters Grand Prix Individual title in this division, took first place in the division in 57:09. Al Ray, 85, was the oldest runner on the day, and took the division crown in 1:07:59. You can bet he was hustling to get under 1:08! The Impala Racing Team [Jennifer Bayliss,Nancy Thomas, Suzanne Cordes] from the Bay Area of San Francisco took the title with no opposition. The Atlanta Track Club [Brent Fields, Steve Bell, Brad Slavens, Peter Kotchen, Mark Castleberry] and the Garden State Track Club-New Balance [Elliott Frieder, Sam Teigen, Jonathan Frieder, Chuck Schneekloth, Aaron Cooper, Thomas Knowles] contested the division but with the new recruits, the Frieder twins and Sam Teigen, GSTC was too hot to handle. In the dual meets I remember as a HS and College kid in the 1960's,once a team went 1-2-3 that was all she wrote. Then it was only the top 7 who could displace so the highest score the could get was 1+2+3+11+12=29 and the best score the other team could get was 4+5+6+7+8=30. Since neither team had more than 6 that rule applied here too. But GSTC was strong after the first three as well. Atalanta's Fields took 4th in the team race and Bell 6th but GSTC's Schneekloth split them up. In the end a strong victory for GSTC-NB. 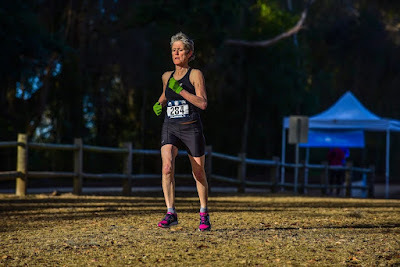 The Athena Track Club [Marisa Sutera Strange, Doreen McCoubrie, Mary Swan], the New Balance Tampa Masters Racing [Trish Butler, Michelle Allen, Lyn Cooke], and the Genesee Vallley Harriers [Carol Bischoff, Colleen Magnussen, Gail Geiger] were entered. GVH was happy to be healthy and in the race and collect their 80 Grand Prix points for third place and on to the next venue. But the 2017 Club GP Champions, Athena, and the NBT were definitely both going hard for the win. The race between those two teams was a doozy! Despite some fitness issues, Strange had no trouble getting 1st. Given that none of the GVH runners were expected to wind up in the top 6, that meant that NBT's Butler had to beat Athena's McCoubrie to have a chance. And the newest 55 year old, did just that, kicking away in the final kilometer, for 2nd place. But once McCoubrie came in 3rd, well ahead of NBT's Allen and Cooke, that took care of it for Athena, winning 10-11! The Atlanta Track Club [Eric Stabb, David Matherne, Jeffery Dundas, Rob Blaskiewicz, Jeff Haushalter, David Alder], Cal Coast Track Club [Christian Cushing-Murray, Michael Connors, Thomas Schumann, Kevin Barda, Brad Wobig], Genesee Valley Harriers [Mike Nier, Dale Flanders, Timothy Riccardi, Dennis Kinney, Michael Reif, Gary Radford] and Greater Springfield Harriers [Kent Lemme, Nat Larson, Mark Hixson, Alejandro Heuck, Francis Burdett, Ron Lombardi], the 2017 Masters Grand Prix Club Champions,went at it in this division. Make no mistake about it, Greater Springfield is not about to give up its GP Championship Banner. 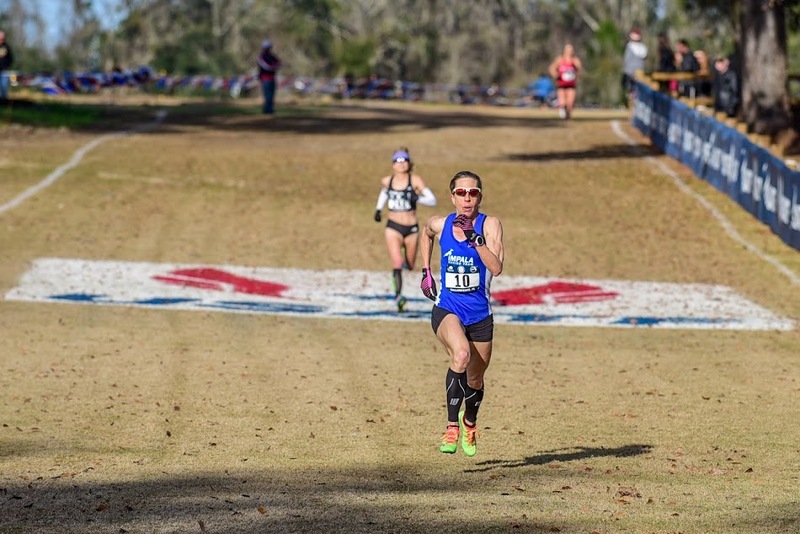 Cal Coast's Cushing-Murray was the only runner able to break up their top 3 from going 1-2-3! The same math as above does not applly when there are more than 2 teams in a race but going 1-2-4 leaves a team pretty safe. That is especially true when they have solid runners to back up the top 3. Stabb and Matherne came in 5th and 7th for Atlanta, and Mike Nier and Dale Flanders took 6th and 10th for GVH, around Cal Coast's Connors and Schumann adding their 8th and 9th toCushing-Murray's 3rd. But when Heuck and Burdett came in 11th and 12th, that pretty much sealed the deal. 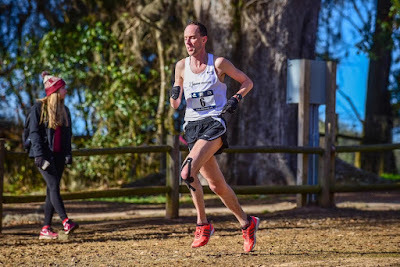 Lombardi finishing in 14th and displacing the 4th runners for Cal Coast and Atlanta was just icing on the cake or adding insult to injury, depending on your viewpoint. Cal Coast and Atlanta had a tighter contest for 2nd. After the first two runners were in it was 11-12, Cal Coast's favor. When Schumann came in just a few seconds behind Connors that gave Cal Coast a nice edge. But Atlanta was still alive as Dundas came in next in 13th place; if h9is compatriots, Blaskiewicz and Haushalter were bunched up close, they might still save the day. But Cal Coast's Barda was able to outrun them and Wobig able to split them. Cal Coast had what it needed for 2nd place. Atlanta took 3rd and GVH 4th. they did not quite have the hrses they needed on this day. This team race was a killer as well. Atlanta [Cynthia Williams, Cynthia Lucking, Elizabeth Unislawski, Terry Ozell], GVH [Sharon Moore, Cheryl Guth, Nancy Munson] , and the Syracuse Track Club [Patricia Ford, Sharon Ames, Carol Dodge] vied for bragging rights and 100 Masters Grand Prix points! Williams gave Atlanta the early edge by coming in 1st but GVH's Moore was 2nd and Syracuse's Ford 3rd so nothing was decided by the first runner alone. The order got jumbled when GVH's Guth came in 4th, Syracuse's Ames in 5th and Atlanta's Lucking in 6th. Tht made it 6-7-8 GVH, Atlnta, Syracuse. When Munson came in next in 7th that iced the win for GVH. But Syracuse's Dodge came in 8th, 27 seconds ahead of Unislawski, to knot things up for 2nd and 3rd at 16. The current tie-breaker rule is that the faster time for the team's last scoring runner (3rd runner for Women's Teams) decides the better finishing team position. That gave Syracuse the tie-brokered 2nd place finish and Atlanta an incentive to even things up in the future! Six teams squared off for this contest: Ann Arbor Track Club Hugh Kuchta, lloyd Hansen, Eduardo Matsuo, Wally Hayes, Aaron Pratt] , Atlanta Track Club [Ken Youngers, Michael Anderson, Phil Richey, Kirk Larson, Jerry Learned], Boulder Road Runners [Nate Anderson, Doug Bell, Chuck Smead, Richard Katz], Cal Coast Track Club [Brian Nelson, Keiith Witthauer, Jeff Salzman], Genesee Valley Harriers [Mark Rybinski, Mitch Moore, Bill Beyerbach, Tim McMullen, David Bowen], Shore Athletic Club Reno Stirrat, Kevin Dollard, Scott Linnell, Roger Price]. It looked, in terms of depth, to be primarily a 3-team race. ordinarily Cal Coast would be in the thick of it but with Holcomb off onn some adventure and Witthauer still not all the way back and Salzman apparently hav9ng some fitness issues as well, the podium seemed out of reach. And it was the same story for Ann Arbor and GVH as injuries have thinned and slower their ranks. Not so for Atlanta, Boulder and Shore. But Boulder wasnot at full strength with neither Spale, Hubbard, nor Hibbard in the ranks. That made it tough for them to keep up with a rejuvenated Atlanta 60's team that had Youngers and M. Anderson going 1-2 in the team competition. Between Boulder, Cal Coast and Shore, they were able to keep it interesting with Nelson, Stirrat, Dollard, and N. Anderson taking 3rd through 6th. If Shore or Boulder could bring in a few more guys before Atlanta's 3rd runner, Richey, they could still contend for first. When Richey came in 7th that closed the deal for Atlanta's first place. With Shore at 9 points after their first two runners, Boulder would have to hope they and other swould bring a bujch of guys in ahead of Shore's 3rd runner. Bell took 8th and Smead 10th for Boulder and they were loving it when Rybinski, on the comeback trail, took 9th, Witthauer 11th, and Larson 12th..Bu it all came to an end when Linnell came across the finish line in 13th place to give Shore the 2nd place finish by two points. Boulder settled for third, with Cal Coast, Ann Arbor and GVH following inthat order. No Women's teams contested this division. Atlanta 'A' [Dave Glass, Curtis Walker, Charlie Patterson, David Turner] , Atlanta 'B'[David Peterson, Ed Bligh, Frank White], Cal Coast[John Combs, William Sumner, William Trapp], and GVH [Tony Gingello, Keith Yeates, Jim May, Thomas Lamme, Patrick Dwyer] went for the win in the 60 and up division. Glass got things started off for Atlanta A with the win, but Combs of Cal Coast took 2nd, and Gingello of GVH 3rd. Coach Sumner came in 4th for Cal Coast, giving them 6 points with two runners in. When the next runner in was Atlanta, but the 'B' team, it meant the 'A' team would have more than 6 points after two runners in. When Yeates and May took 6th and 7th, that closed off GVH's scoring at 16. That left Atlanta A out of the race for the win as the lowest total they could get, with two of their top 3 yet to score, would be 19. Cal Coast needed their 3rd runner to finish 9th or better but that was not to be. Walker and Patterson of Atlanta 'A' prevented that by finishing 8th and 9th and, at the same time, sealed their scoring with 18 points. GVH got the win, with Atlanta 'A' 2nd, and Cal Coast 3rd. 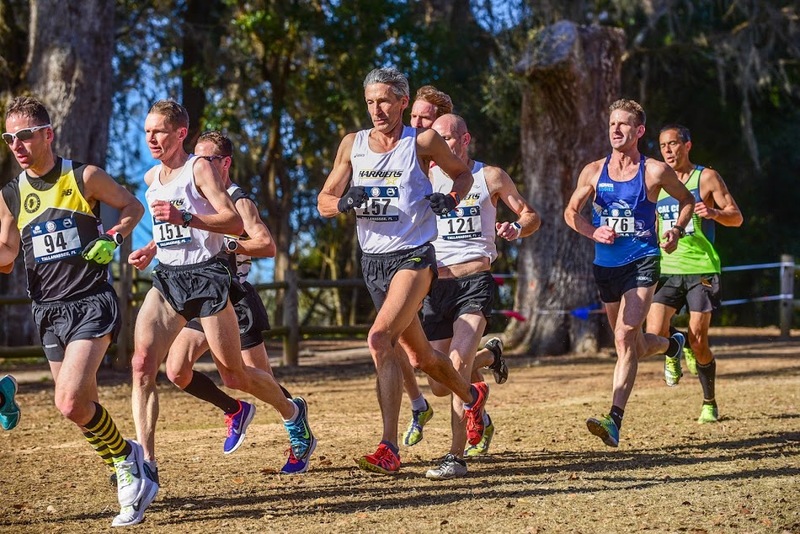 That concludes the Cross Country portion of the Masters Grand Prix circuit, at least until mid-September.There were many terrific races at every level. Some had performances to savor and remember; others had performances they will want to redeem in the future. There are lots of opportunities ahead. Now we are off to the roads! First stop, Virginia Beach and its flat, fast course on Pacific Avenue and the oceanfront boardwalk on St. Patrick's Day. 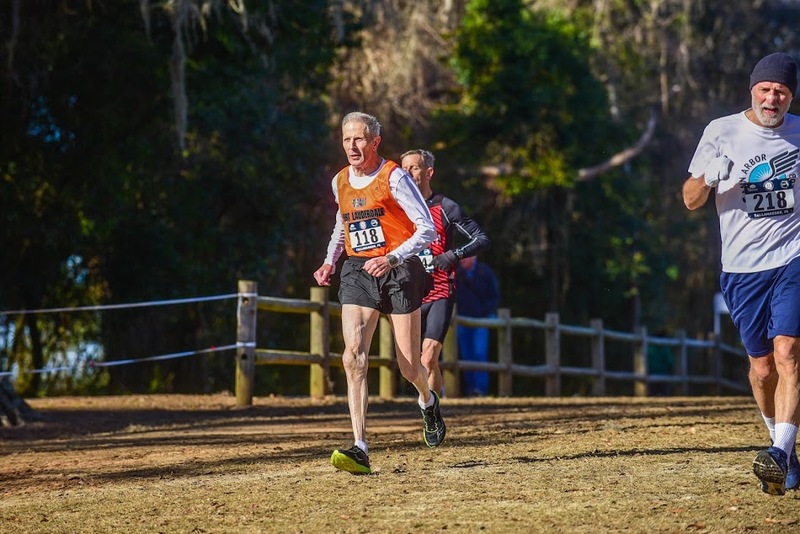 This will be quite a contrast to the first two races on the circuit, the Masterson Park XC course in Lexington and this one at Apalachee Regional Park in Tallahassee.